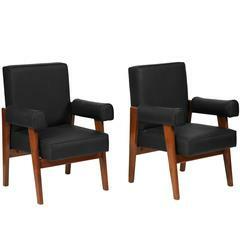 Set of two "Senate-committee" teak chairs, flat inclined backrest, compass base with tapered legs. 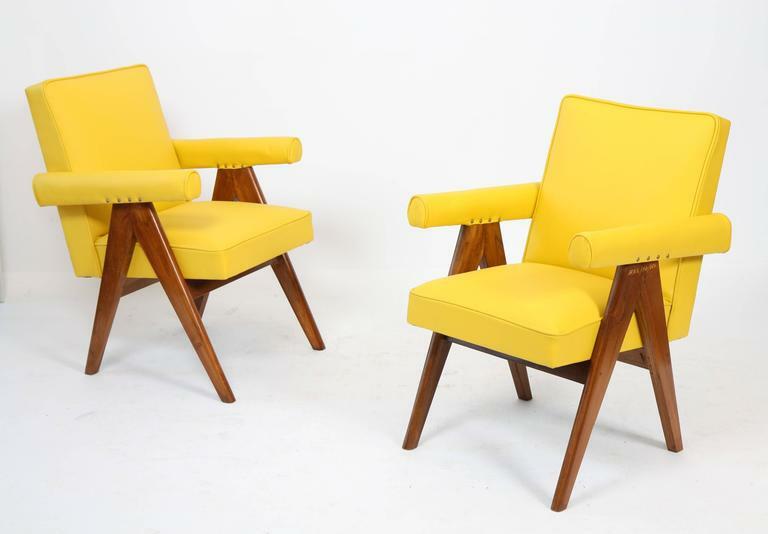 Detached armrests with rounded seat, back and cuff covered with restored yellow leather, circa 1955. Height: 82 x width 60 x depth: 56 cm approx. Provenance: Chandigarh, India. References: Similar copy in E.Toucaleaune & G. Moreau "Le Corbusier Pierre Jeanneret - l'Aventure Indienne" Editions Gourcuff Gradenigo reproduced in color page 563 (PJ-SI-30-A). References : Patrick Seguin, "Le Corbusier Pierre Jeanneret, Chandigarh India from 1951 to 1966, Seguin Gallery, 2014, p. 161-162 and p.283. Magazine "Architectural Digest", France, May 2010, P52. Barbel Hogner, "Living with the Corbusier Chandigargh" Jovis, 2010, p33. Magazine "Architectural Digest", France, December 2014-January 2015, p. 136-137. Amie Siegel, Catalog, Prem Krishnamurthy, 2014, p. 33 and p. 288289. If his famed cousin and longtime colleague Charles-Édouard Jeanneret — better known as Le Corbusier — was the visionary, then Pierre Jeanneret was the member of the architecture and design team who got things done. In recent years, Jeanneret has emerged from Le Corbusier’s shadow, as collectors have discovered his simple and striking furniture creations. Jeanneret studied at the École des Beaux-Arts in Geneva and after he graduated in 1921 he became a partner in Le Corbusier’s office in Paris. The pair collaborated on numerous residential projects, most notably the Villa Savoye, the iconic modernist house in suburban Paris completed in 1931. Jeanneret also worked with the great Charlotte Perriand on the Grand Modele line of tubular metal furnishings that was a sensation at the annual Salon d’Automne design expo in 1929. A rift developed between Jeanneret and his cousin during World War II, as the former joined the French resistance, while Le Corbusier cooperated with the occupation Vichy authorities. The two did not work together again until 1950, when Le Corbusier persuaded Jeanneret to help execute the master plan for the new city of Chandigarh in Punjab, India. Jeanneret lived and worked there until the final years of his life. 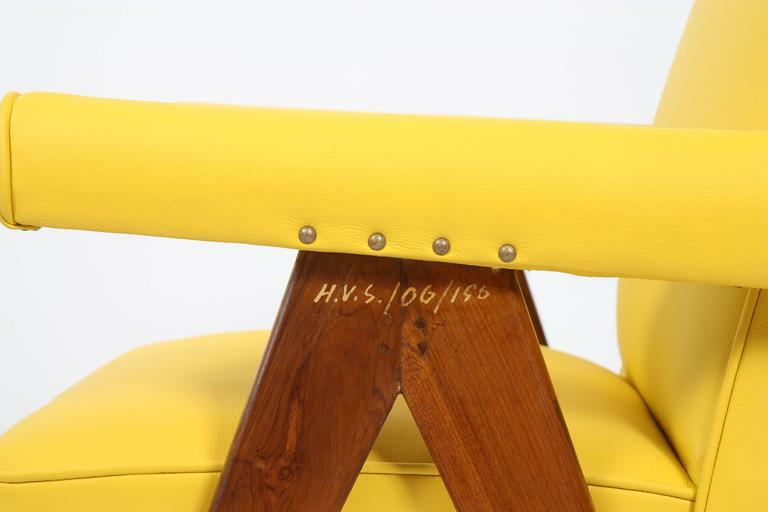 A hallmark of Jeanneret’s furniture designs is his great sensitivity to materials. In contrast to the tubular-steel chairs produced by Marcel Breuer and other members of the Bauhaus, the chromed metal pieces designed by Jeanneret and Perriand — including such as the now-classic LC/4 chaise longue and the Grand Confort lounge chair — have a sensuous, relaxed and welcoming look. Conversely, while Jeanneret uses essentially geometric forms for his wooden seating pieces, they exude warmth by nature of the material. 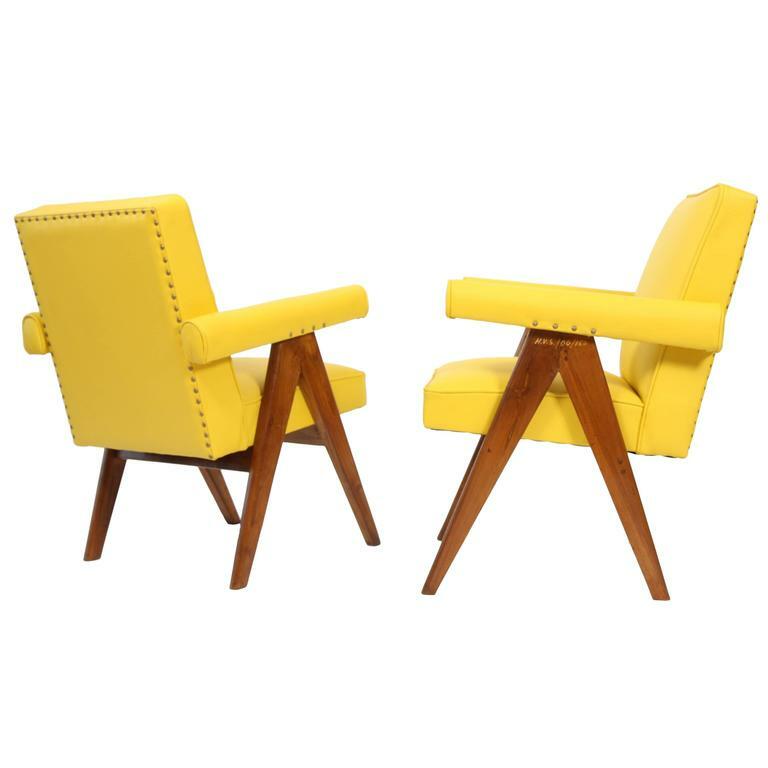 One of his first manufactured designs in wood is the Model 92 Scissors chair, licensed by Hans and Florence Knoll when they were touring postwar France. But Jeanneret’s finest work in furniture was done in Chandigarh, and these are the pieces that have earned him recent renown. Crafted of teak, the designs range from low-slung lounge chairs and armchairs with cane seats to desks and tables, most with Jeanneret’s signature drafting compass-shaped legs. Many such pieces on the market today are refurbished, having been found by dealers languishing in scrapyards in India in the late 1990s. 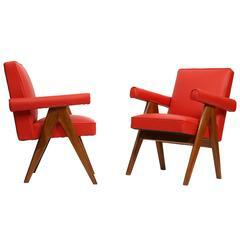 Chandigarh is now taking better care of its modernist heritage, making available Jeanneret works all the rarer. 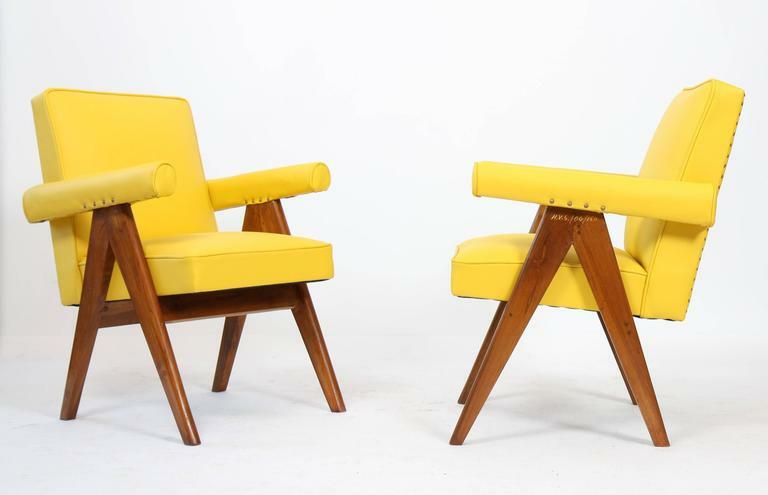 Le Corbusier, Pierre Jeanneret "Lawyer Chairs"
Pair of original folding Cinema chairs from Chandigarh, circa 1960 Teak wood, heavy solid brass fittings and new caning. Measures: 34 × 23 1/4 × 19". Office chairs from the administrative buildings of Chandigarh (PJ-SI-28-B).